We’d love your help. 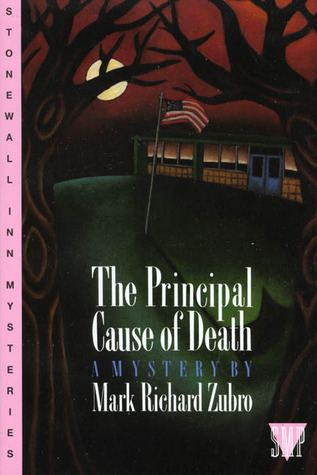 Let us know what’s wrong with this preview of The Principal Cause of Death by Mark Richard Zubro. The latest in the Lambda Literary Award-winning Tom and Scott series. When schoolteacher Tom Mason is accused of killing the high scool principal, Tom and his lover, Scott Carpenter, set out to catch the murderer and prove Tom's innocence. To ask other readers questions about The Principal Cause of Death, please sign up. Good gay mystery in which Tom has an altercation with a student and accused of murder. Active all the way through, emotional both good and bad. One of Zubro's best efforts. The ending had many twists and characters all were fleshed out. No one dimensional characters you could feel sorry for all. Being the Principal at Tom's high school is a little like teaching Defense Against the Dark Arts at Hogwarts. Not a lot of job security or longevity in either position. In this the fourth book of the series, the principal is murdered and Tom is a suspect. Zubro also makes the mysteries entertaining and, he tosses in enough twist and turns to keep the reader guessing. Tom is extremely angry at being a suspect and being questioned by the police. He has solved enough murders to know that someone who Being the Principal at Tom's high school is a little like teaching Defense Against the Dark Arts at Hogwarts. Not a lot of job security or longevity in either position. In this the fourth book of the series, the principal is murdered and Tom is a suspect. Zubro also makes the mysteries entertaining and, he tosses in enough twist and turns to keep the reader guessing. Tom is extremely angry at being a suspect and being questioned by the police. He has solved enough murders to know that someone who argued with the victim shortly before their death and discovered the body is always a suspect. It wasn't personal but police procedure. Tom's anger was the on thing I didn't like about the book. It bordered on arrogance.... how dare they accuse me type thing. This was a basic murder mystery. Nothing earth shattering but an easy, 182 page read. I liked that it took place in Chicago and the south suburbs where I grew up. I may check to see if this authors previous books are at my local library. Tom is harassed by the high school bully. Typical Tom and Scott murder mystery. I really enjoyed this exciting mystery. The characters were well rounded and the dialog believable.